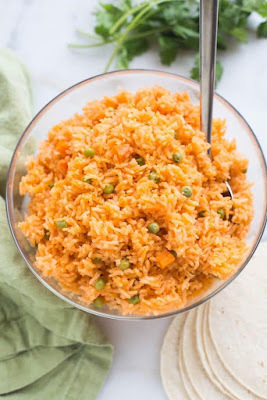 The BEST, truly authentic Mexican rice! Super easy to make from home, and a necessary side dish for all of your favorite Mexican recipes. Rinse and drain the rice in a fine mesh strainer. In a large saucepan over medium-high heat, add the oil. Add the rice and stir to combine. Cook over medium heat, stirring frequently, until the rice is lightly golden brown all over (about 10 minutes). Add tomato sauce, garlic, and diced onion to the pan. Stir. Add the tomato bullion cubes, salt, carrots, peas, and water (and serrano peppers, if using. They add a little flavor, but not spice.). Cook, stirring, until bullion cubes are completely dissolved. Bring to a boil, then cover, reduce heat to low and cook for about 20 minutes or until the water is completely absorbed. Remove from heat and allow to rest for 5 minutes before fluffing with a fork. Serve this with one of my favorite authentic Mexican meals. 0 Response to "AUTHENTIC MEXICAN RICE"